Cor. It's been a while since I last updated. Sorry about that. Things have been rather hectic chez Madchickenlady. But anyway, I now have a spare twenty minutes or so to catch up, so let's plough on. Today, as in, right now, there are two men in my garden dgging it up. No, it's ok. There has been no disaster (unless you count the three months of solid rain we've all had to put up with). They are landscaping. Well, landscaping may be a bit of a grand title for what is actually happening. They are laying slabs which will house the new coop, gravelling around said slabs so that I can eventually plant chicken resistant plants, and also gravelling an area for the youngest's enormous trampoline. I am happy about this for several reasons. One, there is far too much grass out there at the moment. Seriously, cutting it all is a killer. 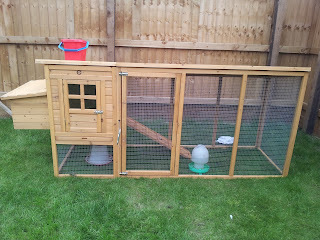 But more importantly, two, the chickens will finally be on slabs, have aubiose to play in, and be safe from predators. And the hell hound. Ah, yes, the hell hound. Since I last posted, he has launched a full on assault on my ladies. The new coop had a perspex window. Notice the use of the past tense. He headbutted through it, and we had to replace it with a metal grill vent (which, incidentally, is brilliant ventilation while also keeping the wind and rain out). He also leapt at the weld mesh near the ramp so much that the mesh began to come away from the frame. The ever tolerant husband had to crawl through the slimy, chicken poo soup floor of the run to repair that. He was not overly happy. And by far the worst crime? He managed to get his chops around Hilda. It was one of those split second things. The ever tolerant husband opened the coop roof to see if he could fix something else that was dropping of it (Seriously, I miss the Palace every. Single. Day. ), and Hilda made a bid for freedom. The dog was out the door and across the garden like lightening. Hilda squawked, the dog grabbed her and tossed her high in to the air, husband, Madchickenlady and eldest all ran around in a Benny Hill stylee trying to rescue her. In the end, the eldest stopped chasing and bellowed the 'LEAVE IT' command. The hell hound dropped the indignant chicken. I grabbed her. The dog was banished to his basket in disgrace. We all caught our breath, chicken included, then I gave her the once over. She wasn't missing so much as one feather, but had crapped herself explosively in terror. A quick rinse under the outside tap restored her to her brillaint white glory, and I popped her back in to the coop. She sat on the perch, preening herself indignantly, apparently untraumatised by being used as a shuttlecock by a very rude young dog. This is the second time he has managed to get his face wrapped around a chicken, and both times we managed to get away without any casualties. This hasn't made me complacent, but I am relieved that when he does catch one he mainly wants to play with it like a squeaky toy. There has so far been no attempt to dismember or consume. But with any luck he won't get another chance to test my theory. I have extra grey hair as a result of his antics. So, Hilda escaped her ordeal with nothing but an embarassing toileting disaster. But other than that, she is fine. My mighty mille's are still going strong, although Maude seems to be going in to a bit of a mini moult. She is pale of face and reasonably bald right now, so I'm adding poultry spice to their grub and keeping an eye on her. 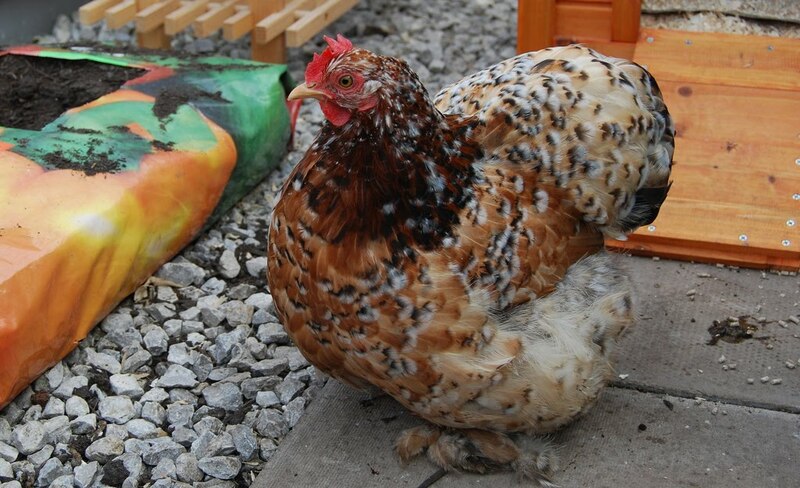 Maeve, the fearsome ASBO Chicken, is still determinedly broody. Daily, I remove her from the nest box and plonk her on the lawn, where she sits flattened out like a malevolent beret, hissing at anyone that ventures near. So pretty much business as usual with the Evil One. When the new coop is in situ I will take some pics. Fate is a cruel mistress. For two years, my girls resided in the small but quaint Convent. It was easy to clean out, looked great in the border, but severely limited my flock size. So the Palace came to be. And for two years, they lived mostly harmoniously in a flock of ten. Yet, after some untimely deaths and a few girls moving to pastures new, my small flock of four began to look rather lost in their giant house. So now they are going to live here. This is a perfectly pleasant, back garden coop. It is not dissimilair to the Convent. Once the Palace has been taken away by its new owner, I'm sure I will embrace it with happiness and love. But as it stands in the garden, and the Palace is sill here for comparison, my heart sinks a little. This is a step backwards and there's no denying it. Yet I console myself with the knowledge that my ladies won't freeze to death in their cosy new dwelling. If this coop is a warm little flat, the Palace is a draughty stately home. This afternoon, I moved the pekins from their old home to their new one. They reacted much as chickens will, and didn't notice for at least an hour as they were too busy scoffing toast. Then, they noticed. Maeve and Hilda, still deep in their broody psychosis, took it the hardest. They wanted a nice dark nest box to dream in, and the change in location means that their tiny bird brains can't work out how to find one. So they stand, frozen with indecision, and stare in to the middle distance. Mabel and Maude, the much more sensible mille's, spent the time pecking about at the much smaller perimeters of their new home. Once nest box angst and exploring were exhausted, however, they grouped together in the middle of the run and looked perplexed. Much chuntering ensued. They observed the puppy wandering around inside the Palace's grounds, and chuntered some more. After a brief huddle, Hilda attempted the ascent in to the house. She managed to get half way up before her ascent became a descent. Slowly, she began to slide backwards. She greeted this development with mild surprise which quickly turned to alarm as she picked up speed. Landing on the floor in an undignified heap, she squawked her displeasure. It seems that this ramp has a steeper gradient than the Palace's. When I next looked out, the run was empty. All four birds had found their way in to the new premises. I peered through the perspex window, and four curious birds peered back. They tested out the perches and pecked at the aubiose. The pup ran around the coop, looked in through the pop hole and made eye contact with me through the window. This blew his tiny spaniel mind. All in all, I don't suppose they will mind the reduction in their circumstances. I'm sure I will mourn the pekin empire dream more than they will. And in the end, I know that they are well cared for and will see out their lives in comfort. This new house needs a name, though, so all suggestions are welcome. I hope the house warming is a quiet affair. Oh, sweet, sweet broadband! After three months without a phone line, we are finally back in the technological age. And oh, dear reader, I have so much to tell you. So much in fact that I'm bound to forget something and need to add stuff. So please bear with me. Firstly, some very sad news. I lost both my beautiful serama. Betsy went down with a mystery illness at the end of April. She was hunched and not eating well, so I brought her inside in the warm and nursed her. At first I thought maybe she was just depressed at being bullied, as she was very much the bottom hen. But then her neck was starting to go wry, and she was missing her food bowl when trying to eat. I suspect it was some kind of neurological condition. I treated her with baytril in the hope that if it was a bacterial infection she might pick up, but sadly she passed away on the first of May. None of the other birds seemed ill, but I added a tonic to their water and scrubbed the coop anyway. We were away on June 5th when my lovely chicken sitter found Vera dead in the coop. There was no sign of illness, although her vent was a little mucky. However, this could have happened at the time of death and she was in fine form when I saw her two days previously. Her weight was good, there was no sign of injury and all in all it's a head scratcher. The other birds were afected by her passing, as she'd had the audacity to cark it infront of the pop hole. Pekins have such stumpy legs that they couldn't clamber over her corpse and had to wait until the chicken sitter's mid morning visit to get breakfast. I like to think that she did it on purpose. She had spirit, that little bird. Losing both girls inside of a few weeks was very disheartening. I now have four pekins left, Mabel, Maude, Maeve and Hilda. As I watched my four remaining girls pootle around the garden it occurred to me that I have gone a full circle. I started off with four hens, and now I am back to four. Now that we have the nutty pup, I am not prepared to go through the trauma of new introductions to such an established group. So my new plan is this. My remaining girls will live out their lives without getting to bully any newcomers. But they will do so in a smaller residence. Yes, with a heavy heart I have decided to sell the Palace. It's far too big for four birds, and in the winter they'd freeze. 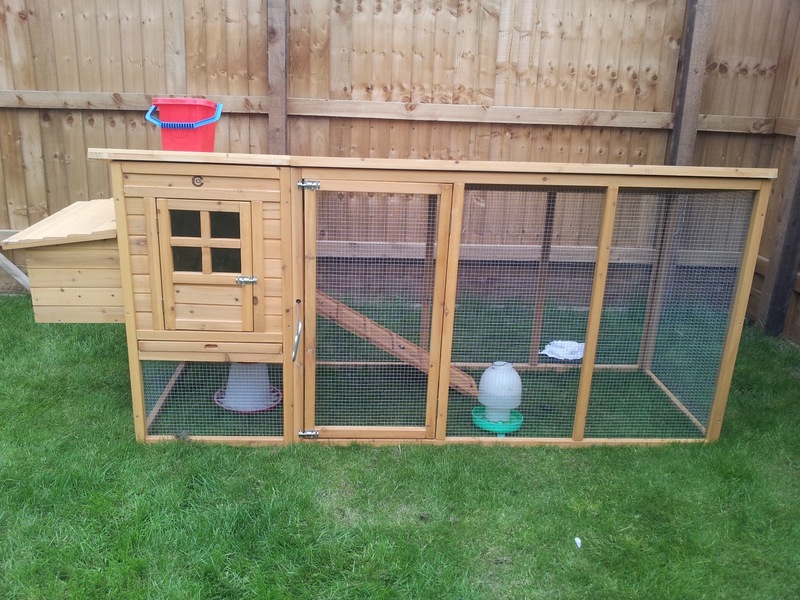 So I have purchased a smaller coop, not so different from my original Convent, which they will find cosy yet still adequately spacious. In fact, said coop has just been delivered in two enormous boxes. I am going to landscape around the new coop with the aid of a garden designer and make it a feature of the border. Hopefully. And so, the girls. You'll be pleased to hear that my magnificent mille's are still going strong at 4 years old, and even still laying the odd egg. Sometimes very odd. One of them layed an egg last week which looked like it had been shot. There was a perfect, round hole at the blunt end, surrounded by a black ring which looked singed. I actually cracked it to see if there was a projectile inside. The egg itself was perfectly normal and the membrane intact. I checked both girls, too, and found no hidden laser stashed under anyone's bum feathers. Another strange chickenny mystery. Hilda has been broody for a month now. I kick her from the nest regularly, dunk her in water and basically wait for her to snap out of it. If last year is anything to go by, that should happen when she moults. So around August, then. In much scarier news, the fearsome ASBO Chicken has also fallen under the broody spell. So narked is she if disturbed that she has taken to lunging at the pup through the mesh of the run if he gets too close. I swear there's some rottweiler in that bird's DNA. I am a suburban chicken keeper who threw herself in at the deep end. Maude - Mabel's hench-chicken. MIllefleur Pekin. So, Er, Where's The Winter Then? It doesn't quack, so what makes it a duck?